Delta Children Activity Easels Just $32! Down From Up TO $60! You are here: Home / Great Deals / Christmas Deals / Delta Children Activity Easels Just $32! Down From Up TO $60! Right now you can get these Delta Children Activity Easels for just $32 (Reg. up to $60) at Walmart! 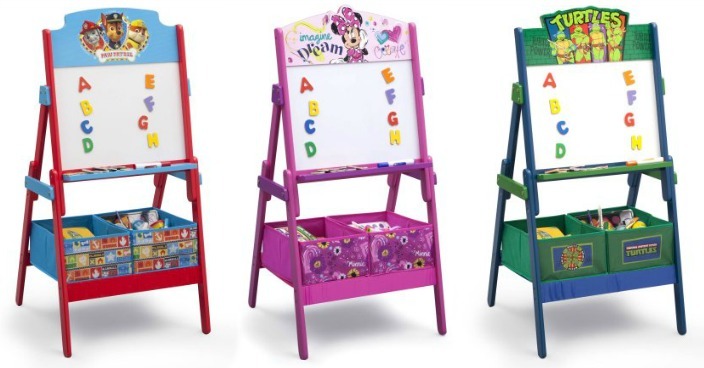 Sure to inspire the sweetest sketches, these Activity Easels from Delta Children feature a magnetic dry erase surface that will showcase all of you child’s masterpieces. Topped with a colorful image of their character, it includes alphabet magnets and two fabric bins underneath, so your child can store chalk, markers and all their works of art.